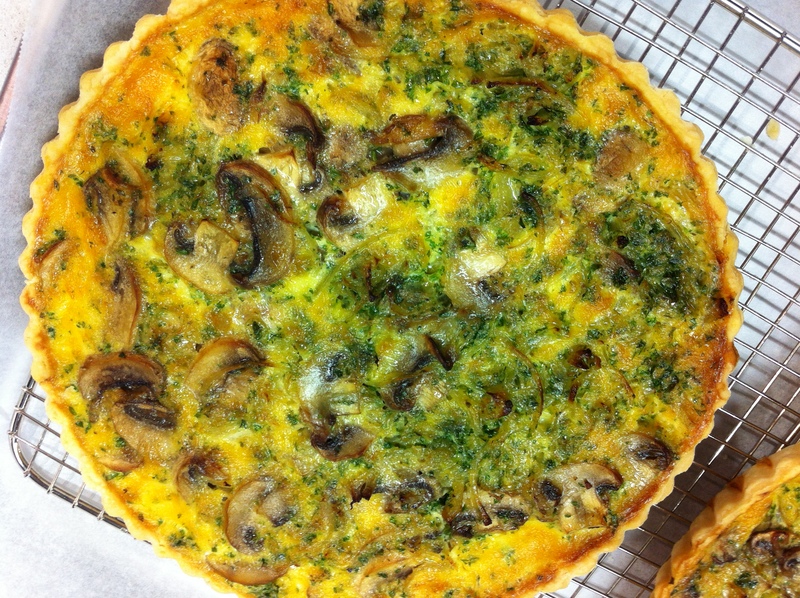 The quiche is behind me and even though we are still in pastry mode, the dish we are making in class is rustic. For me, kneading dough is a bit like gardening. It’s energetic and satisfying but not too taxing on the brain. After very little sleep it’s just what I need. 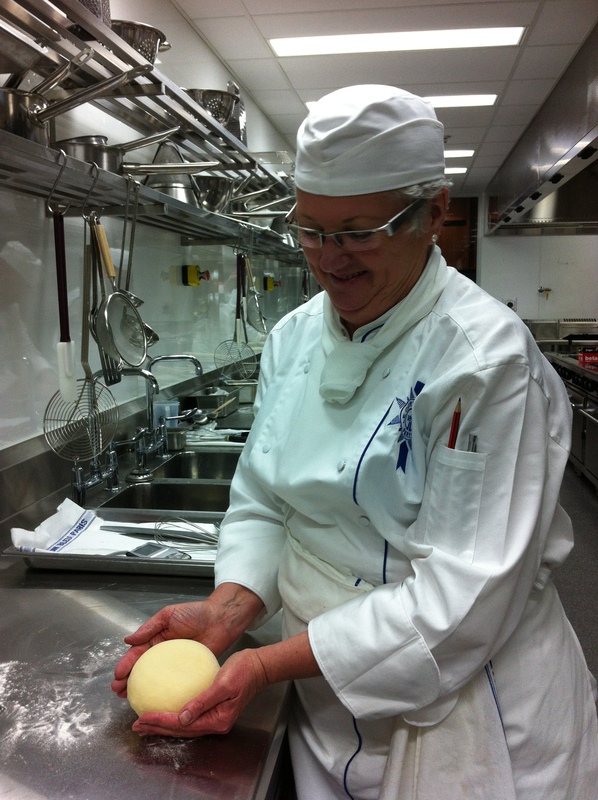 Chef brings the dough together by hand with a delicate touch. We won’t be using food processors for our pastries. He hardly uses any flour as he starts kneading on the marble bench. Too much flour and you risk drying out the dough. He reminds the class what happened to some of the quiche yesterday reinforcing the need to get the moisture content just right. He ends up with a fleshy looking mound of dough that’s smooth and soft. It needs to rest now. He starts talking about the topping and in particular the anchovies. 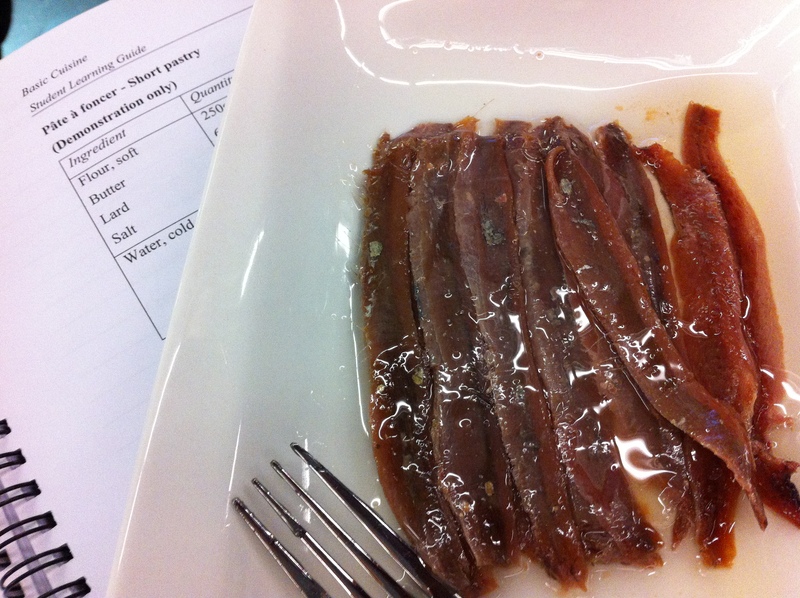 Ortiz anchovies are the best you can get in New Zealand but they are really expensive and you wouldn’t dream of using them like we will be, in large quantities in beautiful straight lines as topping across a big tray of base. But of course, we get to use the next best. 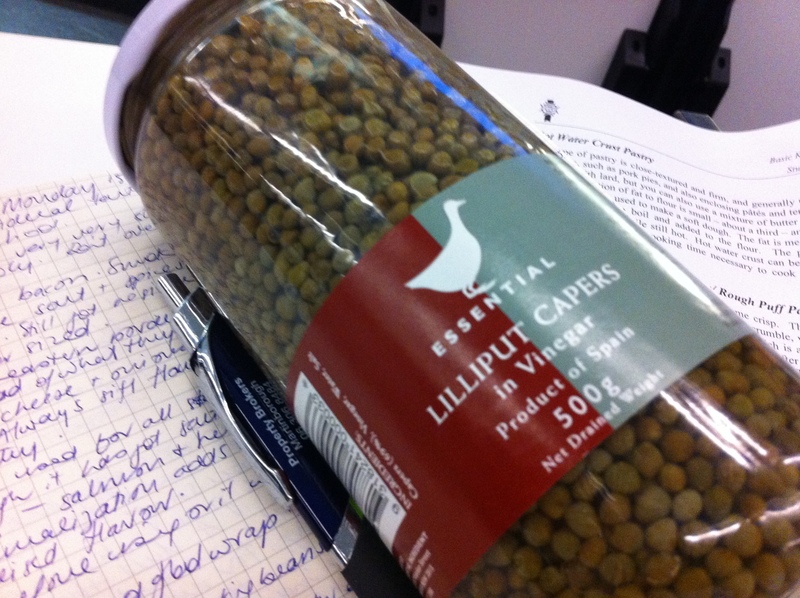 And the capers are special too. They’re small and delicate and nothing like the humongous caper berries which are currently fashionable. We’re not making pate a foncer, a short pastry made with half butter and half lard but Chef makes some to use as the base of a Tarte Forestiere. It’s the butter that gives the flavour and the lard that produces the right texture. The filling is a batter made with eggs, cream and milk – full-cream milk – and sautéed onions and button mushrooms. This is classical French food at its best. He agrees that there is some room for creativity but you know his heart isn’t in it. Many French restaurants, he says, have used the same formula for years and years. It works so why deviate. It’s the most magical day in the kitchen. I am calm and confident. There’s not too much to do. My dough looks perfect. I love doing this stuff by hand. It’s a mound of dough. Not the Cullinan Diamond! After rising to double its size I knock it back before rolling it into a thin layer – no cracking at all. I brush the large baking tray in olive oil, cover it with baking paper that I brush in olive oil. Place the dough perfectly on top which I brush with olive oil. It’s glistening. The smell of yeast fills the kitchen. The ovens are heated and ready to accept the goodies. The atmosphere is the most relaxed it’s been to date. 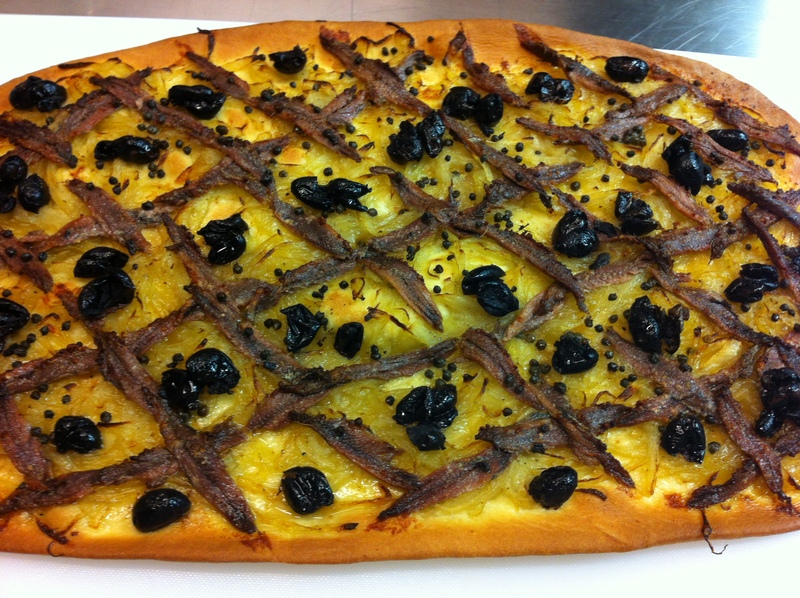 It seems we have all the time in the world to delicately layer the anchovies across the dough and then dot the stoned olives and capers on top. This rollercoaster ride of Disney proportions continues and today at least, I am on a crest. Oh this sounds wonderfully cruisey – so much more relaxed although there’s still plenty of learning going on. Glad you’re enjoying it all. Interesting to see how traditions stick – if it ain’t broke….. But by the look on your face it would be the Cullinan Diamond!! Well done!! Sorry – it could be the Cullinan Diamond.